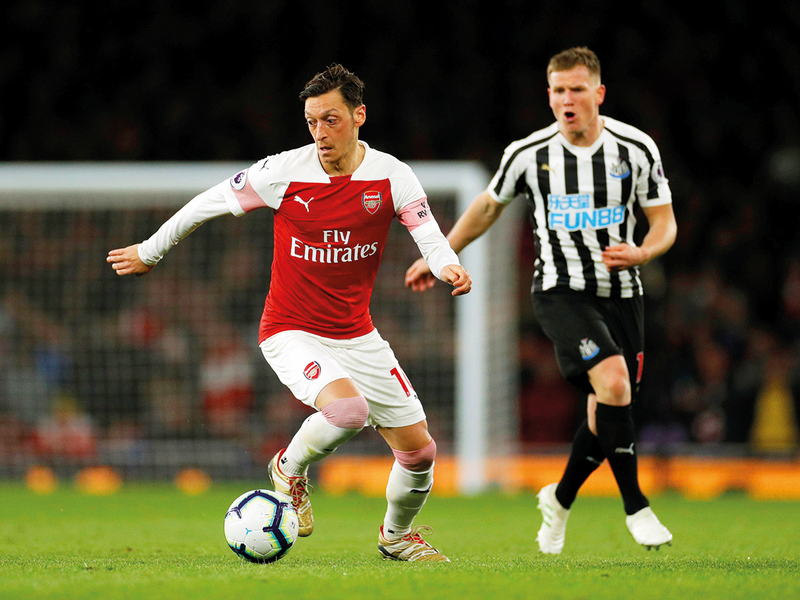 Liverpool: Arsenal midfielder Mesut Ozil is in line to feature more regularly in away matches starting with Sunday’s trip to Everton as the north London side look to clinch a top-four Premier League finish, manager Unai Emery said on Friday. “Now he’s OK, training every day and he can play in different systems. He’s working very well, playing very well, he’s helping us. I’m very happy with him.” Ozil has generally played as a central playmaker this season, either behind one striker or behind the pairing of Pierre-Emerick Aubameyang and Alexandre Lacazette. A stellar home form has propelled Arsenal into the Premier League top four but their chances of staying there now depend on improving patchy results away from the Emirates Stadium. The Gunners can climb above Tottenham into third place should they avoid defeat at Everton. As well as Everton, Unai Emery’s men must travel to Watford, Wolves, Leicester and Burnley. “We are thinking game by game and we know we have five of seven matches away — for us it’s a big challenge,” said Emery on Friday. Arsenal have won just twice away from home since November — at League One Blackpool in the FA Cup and already relegated Huddersfield in the Premier League. “The last matches in the Premier League — Tottenham and Huddersfield — we’ve had good performances and results, and were competitive,” Emery said. “We are getting better and being competitive at home. We want to be the same away but we know that the difficulty is that in each match at home, they (the other team) can feel better.